Everybody’s least favourite protest church is getting contempervant. First up, they’re targeting a comic convention. Because God apparently hates nerds, and super heroes are idols. The proof text on that sign, Romans 9:13, is a little bit odd. Apparently Esau was a nerd. This just shows a bizarre disregard for any description of Jacob (a mummy’s boy) and Esau from the Bible (Genesis 25). Esau is an anti-nerd. It seems more likely that God loves nerds who stay at home quietly with their mothers. I’d go a step further and suggest that the Westboro Baptist crew, in their militant and confrontational approach to spreading the gospel, have embrace an Esau like approach to life. And thus they are damned by their own proof text. 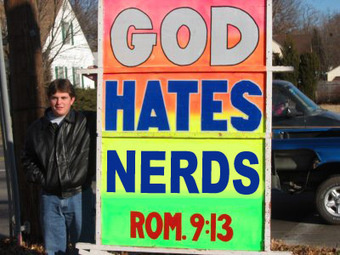 I noticed your protest of the Comic Convention featured a sign “God Hates Nerds” citing Romans 9:13 as a text. Romans 9:13 “Jacob I loved, Esau I hated” doesn’t really work when applied to nerds. Esau was the least nerdy of the pair – in fact, Genesis’ description of the brothers (25:27-28) suggests that it was, in fact, Jacob who was the nerd. Jacob stays at home with mum (typical nerd behaviour) while Esau goes outside and hunts like a man. “27 And the boys grew: and Esau was a cunning hunter, a man of the field; and Jacob was a plain man, dwelling in tents. If you’re going to use scripture to back up your arguments at least do it properly. Other events that Westboro Baptist will be protesting in the near future include a Baseball game (God hates sport), and a Lady Gaga concert (God hates gender ambiguous costumed pop stars). Thanks to my friend Mika for the tip.